relation - that of a brother and a sister. This relationship is no where so celebrated as in India. Raksha Bandhan is a festival which celebrates the bond of affection between brothers and sisters. It is a day when siblings pray for each others' well being and wish for each others' happiness and goodwill. Around mid-August, Hindus all over the world celebrate Raksha bandhan. "Raksha" means protection, and "bandhan" means bound or binding. In North India, the occasion is popularly called Rakhi, Raksha Bandhan or Rakshaa Bandhan- the tying of an amulet. In ancient times a woman tied a 'rakshaa' on her husband's wrist to protect him from evil. Gradually this changed; she tied a 'rakshaa' on her brother's right wrist, to protect him from evil influence and those factors which may taint his character, and to strengthen the bond of sibling love between them. On the occasion of Rakshaa Bandhan she visits her brother's home and performs his 'pujan' by applying kumkum and rice grains on his forehead. In return the brother gives her a gift and vows to protect her too. The 'rakhadi' for rakshaa bandhan itself ranges from a coloured cotton string to exquisitely decorated balls of various sizes and materials such as fluffy cotton, 'zari' paper, tinsel, beads and so on. On Rakshaa Bandhan a second imortance relates to 'Baleva' and our devotion to the Lord. Just as Bali Raja offered devotion to Lord Narayan by sacrificing his kingdom and himself, devotees should endeavor to emulate him. That is the true spirit of Baleva. Rakshaa bandhan day is important for the priests too, as they tie rakhis on their patrons wrist and in return receive offerings from them. In some parts of the country it is customary to draw figures on the walls of their home and worship them with offerings of vermilion and kheer. The imprints of palms are also put on either side of the entrance and rakhis are stuck on them as part of rakshaa bandhan rituals. Some parts of India also reserve Rakshaa Bandhan day importance for the sacred thread changing ceremony when the young brahmin boys discard the old one and don a new one ritualistically. However, on rakshaa bandhan it is the emotions which are important. The rakshaa bandhan ceremony performed is the symbolic everlasting bond between brothers and sisters that reinforces ties between them even across continents, and it is the one which has the most importance on this auspicious day. The Meaning of Raksha BandhanRelationships are the essence of any festivity and it holds true for any Indian festival. Each occasion brings the family together which calls for a celebration. Raksha Bandhan is a celebration of one such relation - that of a brother and a sister. This relationship is no where so celebrated as in India. Raksha Bandhan is a festival which celebrates the bond of affection between brothers and sisters. It is a day when siblings pray for each others' well being and wish for each others' happiness and goodwill. The SignificanceRaksha Bandhan is now considered as a day to celebrate the sacred relation of a brother and a sister. Yet there have been examples in history where in rakhi has just been a raksha or protection. It could be tied by wife, a daughter or mother. The Rishis tied rakhi to the people who came seeking their blessings. The sages tied the sacred thread to themselves to safe guard them from the evil. It is by all means the 'Papa Todak, Punya Pradayak Parva' or the day that bestows boons and end all sins as it is mentioned in the scriptures. Around mid-August, Hindus all over the world celebrate Raksha bandhan. "Raksha" means protection, and "bandhan" means bound or binding. In North India, the occasion is popularly called Rakhi, Raksha Bandhan or Rakshaa Bandhan- the tying of an amulet. In ancient times a woman tied a 'rakshaa' on her husband's wrist to protect him from evil. Gradually this changed; she tied a 'rakshaa' on her brother's right wrist, to protect him from evil influence and those factors which may taint his character, and to strengthen the bond of sibling love between them. On the occasion of Rakshaa Bandhan she visits her brother's home and performs his 'pujan' by applying kumkum and rice grains on his forehead. In return the brother gives her a gift and vows to protect her too. The 'rakhadi' for rakshaa bandhan itself ranges from a coloured cotton string to exquisitely decorated balls of various sizes and materials such as fluffy cotton, 'zari' paper, tinsel, beads and so on. 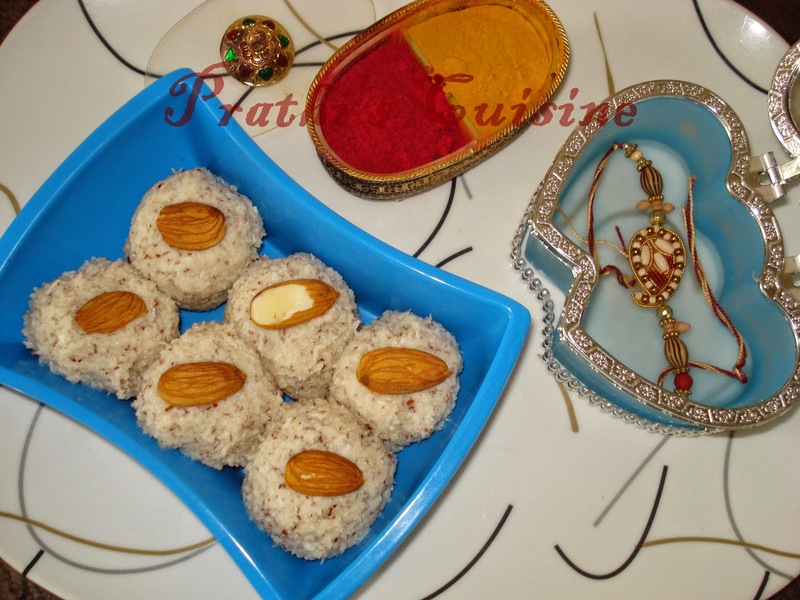 Laddu For RAKHI sweet for rakhi fest..